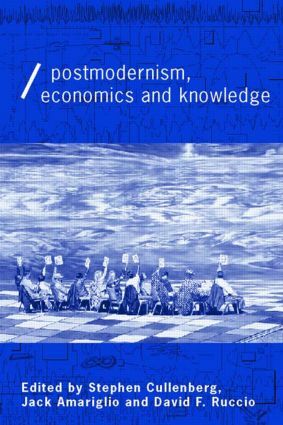 Only in the past twenty years have debates surrounding modernism and postmodernism begun to have an impact on economics. This new way of thinking rejects claims that science and mathematics provide the only models for the structure of economic knowledge. This ground-breaking volume brings together the essays of top theorists including Arjo Klamer, Deirdre McCloskey, Julie Nelson, Shaun Hargreaves-Heap and Philip Mirowski on a diverse range of topics such as gender, postcolonial theory and rationality as well as postmodernism. Stephen Cullenberg is Chair of the Department of Economics at the University of California, Riverside. Jack Amariglio is Professor of Economics at Merrimack College. David F. Ruccion is Associate Professor of Economics at the University of Notre Dame.